Earlier this year, schools and community groups far and wide were invited to get creative and explain why they should be chosen to work with a comic artist on an exclusive project. The lucky groups would produce their very own comic all about the prestigious Roman cavalry based on the unique Hadrian's Cavalry Exhibition currently on display at 10 venues across the Wall. The Cavalry Comics Project is an exciting and unique opportunity for children to work alongside a talented artist and dig a little deeper into the fascinating history of Hadrian's Cavalry. Illustrator Jim Medway was commissioned to work with the winning three groups of children who would use the exhibition at Segedunum and Tullie House as their inspiration. Jim now had the task of helping the children to imaginatively interpret the exhibition and create their own comic exploring what they had learnt about the mighty Roman Calvaly. My name is Jim Medway, and I’m the artist recruited to lead on the Hadrians’s Cavalry Comic project. Over the last ten years or so, I’ve been running Create Comics sessions across the UK and beyond, with all ages and backgrounds. I’ve helped many a group explore the basic skills needed to create their own comic this has spanned from primary school settings right through secondary school, colleges, universities as well as in libraries, galleries, museums, youth groups and community settings. As an illustrator I'm pleased to have had a bredth of experience working on a handful of books (you can see a selection here), as well as a number of projects for museums, galleries and heritage projects. Occasionally a project will involve working with a school group to develop a map, guide or piece of interpretive print, like for a example, a recent booklet I created with Toxteth Primary. However, this Hadrian’s Cavalry Comic Project which I’ve just begun working on is my favourite kind - a project that helps young people engage with history and communicate their enjoyment and learning. 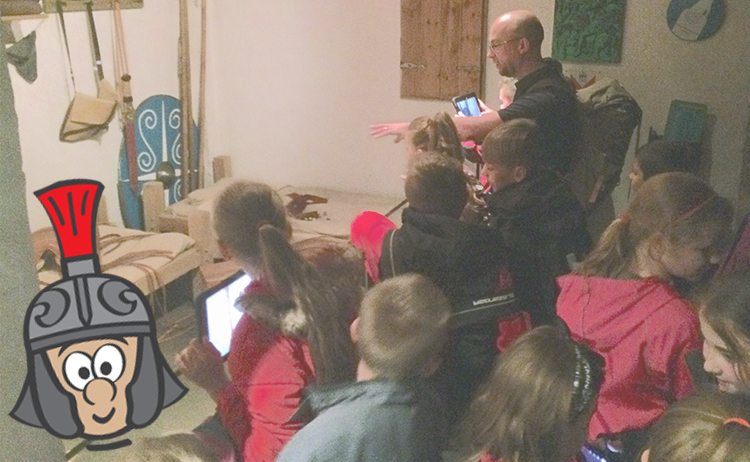 The groups involved in the Cavalry Comics Project are a year 5 class from Milecastle Primary School, Allendale Cub Scouts, and Tullie House Museum Youth Panel. Each group will be having the equivalent of a day working with me to learn the basic cartooning techniques and methods as well as a led visit to a key Hadrian’s Cavalry exhibition venue, and then a third session again with me, in which we’ll document our discoveries and create responses to share. I'll be busy planning and delivering sessions to insight questions, interactions and conversations which can then be strung together and arranged into a satifying visual ‘sequential narrative’ (I prefer the word 'comic', though it does suggest the content is comical!). Whether tied to a school topic or not, I always aim to make sure the participants are central to whatever they are creating. By drawing simple ‘Charlie Brown’ versions of themselves, children can become the protagonists in any story which gives them something more tangible to imagine, and I can avoid the sometimes narrow and uninspiring superheroes they often feel they should be inventing. In the case of our Hadrian’s Cavalry Comic, Milecastle Primary have already visited Segedunum and begun depicting themselves striding around the fort and testing out the barracks for legroom. Some of the children at Segedunum were considering what the Romans would’ve thought of them, and enjoyed the idea of being “future ghosts” wandering the site long ago. As the project progresses, I will be devising ways to combine these drawn snapshots together, potentially adding context and backgrounds myself, and overlapping each groups ‘findings’ with those of the others situated elsewhere along the Wall. I’m looking forward to seeing how the Cavalry Comic Project progresses. Keep an eye out for more from me as we get more exciting sessions underway - I'll keep you updated on how we are getting on and might even share some some of the sketches as they emerge! Find out more about Jim Medway.